Passersby pull elderly man from beach, lifeguards and paramedics attempt but fail to revive him. A 70-year-old man drowned on Friday morning at Hasela Beach in the central city of Bat Yam. He was removed from the water by passersby. Magen David Adom (MDA) and United Hatzalah paramedics administered first aid and attempted to resuscitate the victim, but were forced to declare his death. 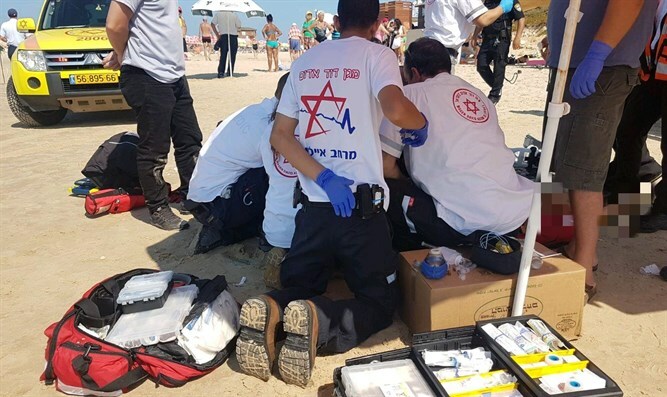 "When I got to the beach, I joined the lifeguards, who were performing basic CPR on a man of about seventy," MDA paramedic Aran Carmel said. "The man had been pulled from the sea onto the beach, and was unconscious." "We performed advanced CPR, but were forced to declare his death."